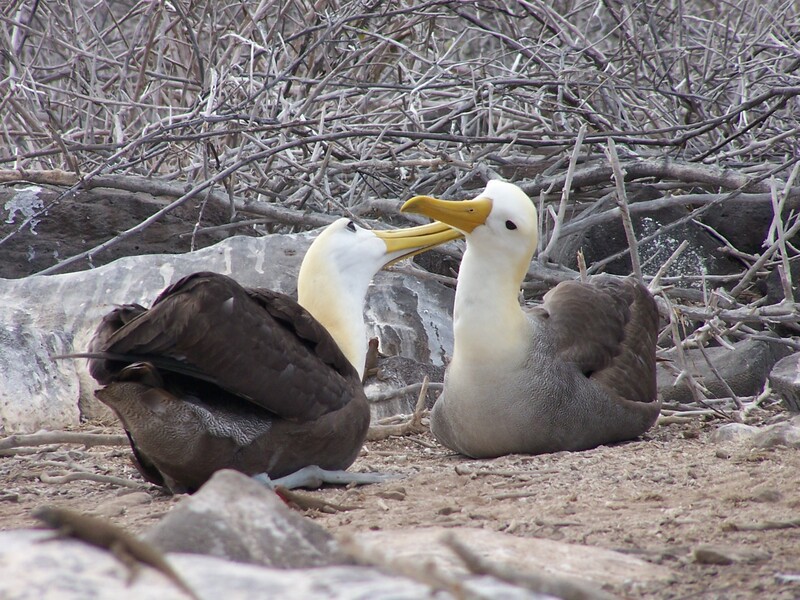 The best way to get a close encounter with five endemic species of the Galapagos Islands. The Galápagos Islands are located in the Pacific Ocean, approximately 1,000 km from the continent. The group of 19 islands are part of Ecuador. These islands are often referred to as Charles Darwin´s laboratory of evolution. The reason: It was here that this famous naturalist developed his Theory of Evolution by natural selection. In fact, many tourists visit the Islands, following Charles Darwin´s Footprints. Book your airplane ticket in advance in order to get the best rates. The best prices are to be found in the route Quito (UIO), Ecuador and Baltra Airport (GPS) in the Galapagos. I personally recommend using Expedia to save some bucks. Now, without further ado, the best way to get a close encounter with five endemic species of the Galápagos Islands. 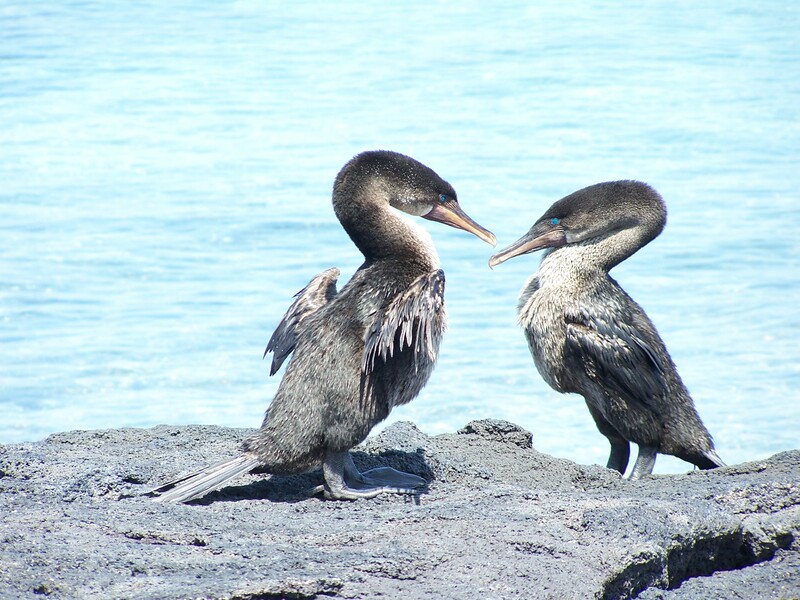 Booking a tour to the Galapagos Islands, will ease communication barriers, allow you to gain inside knowledge, and avoid the hassles of planning and logistics. You will be sure about where you are going and what you are doing, seeing and learning. Here are some great options for you. 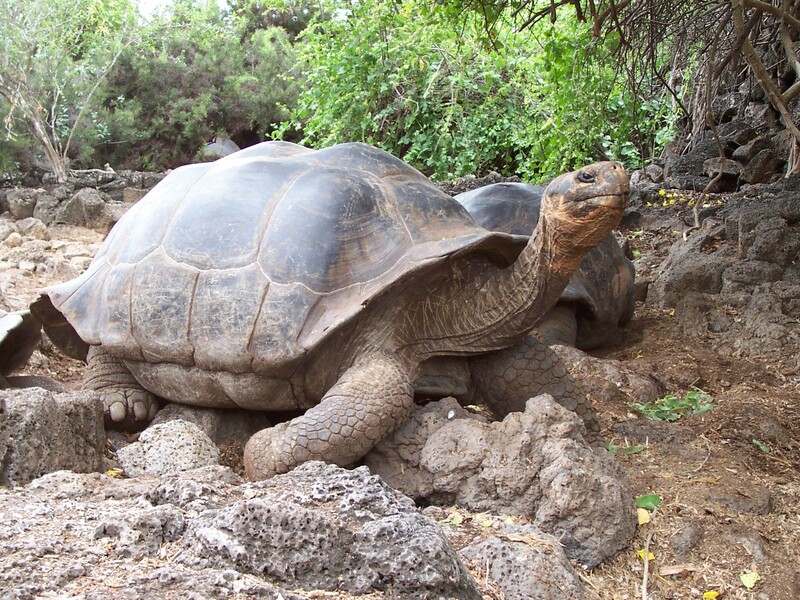 Actually the first endemic animal that the English naturalist, Charles Darwin spotted, was the Giant tortoise. So, I recommend that while in Santa Cruz island you take a bus ride to the highlands of Santa Cruz. Here you will find an area full of green pastures located in the cloud forest. Perfect to watch giant tortoises wild. Also, to walk through tunnels formed by rivers of red-hot lava. Galapagos, Ecuador / #visitsamerica /www.visitecuadorandsouthamerica.com © Carmen Cristina Carpio T.
I guess this is one of the most amazing species that you can encounter on your visit to these islands. Most people just expect to find penguins living in cold weather. It is amazing to believe that pengins could live in the warm weather of Galapagos, near the equator. They range amongst the smallest penguins in the world. They are also rather small, not measuring more than 53 cm. A cute fact is that once a female penguin and a male penguin get together, they form pair bonds for life. 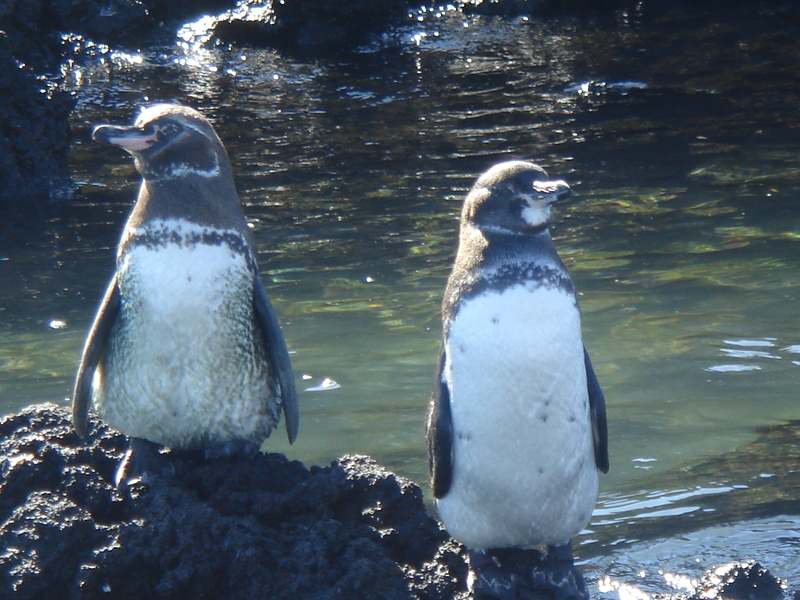 Galapagos penguins are found mainly in Fernandina and Isabela islands. Book a cruise that include in their itineraries a stop on one of these islands. These are the largest of the seabirds species. Also, the only ones located in the tropics. If you want to see them you would have to plan your trip based on their mating season. This is the only time of the year when they come to land and this occurs only in one of the islands, Española. Hence, the best time of the year to visit the Islands is from March to January. Their breeding process takes up to 9 months. If you plan on booking a cruise around the main islands in these months, them you will be able to spot them. These are also some pretty uncommon birds. The fact is that you can only find them in two islands: Fernandina and Isabela. So, consider booking a cruise that includes a stop on one of these islands. Another fact that is even more special is that they are the only one of the species that have lost their ability to fly. Due to the fact that these species used to live and evolved in islands without predators, they stopped needing to fly. Another great activity that you will hardly forget, includes booking a day tour to one of the close smaller islands, La Loberia. 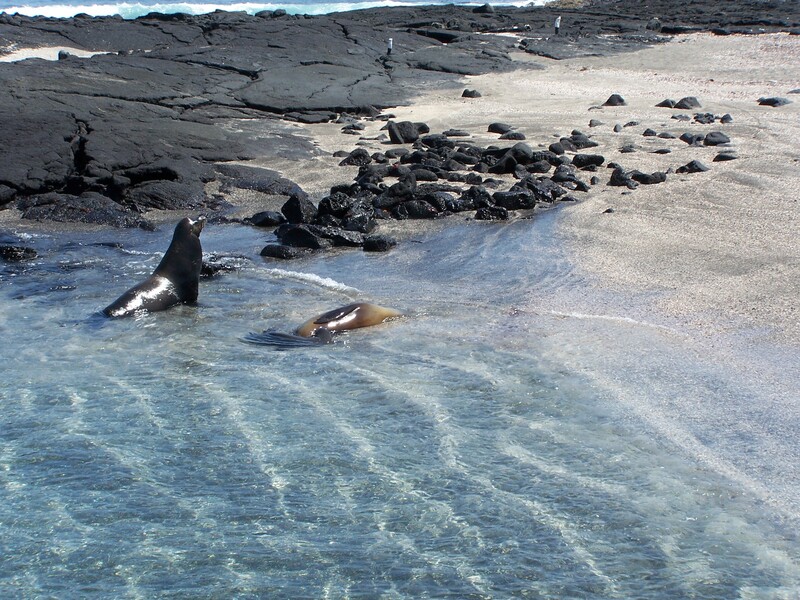 Here you can snorkel with friendly sea lions. Fortunately these species, (Zalophus wollebaeki), only found on the Galápagos Islands are easily spotted in most islands. In brief, you can enjoy snorkeling, biking, diving and kayaking in the Islands. All fun active ways for you to experience a close encounter with these five endemic species of the Islands. Add snorkelling to your list of activities, you enjoy some breathtaking underwater photos like these. 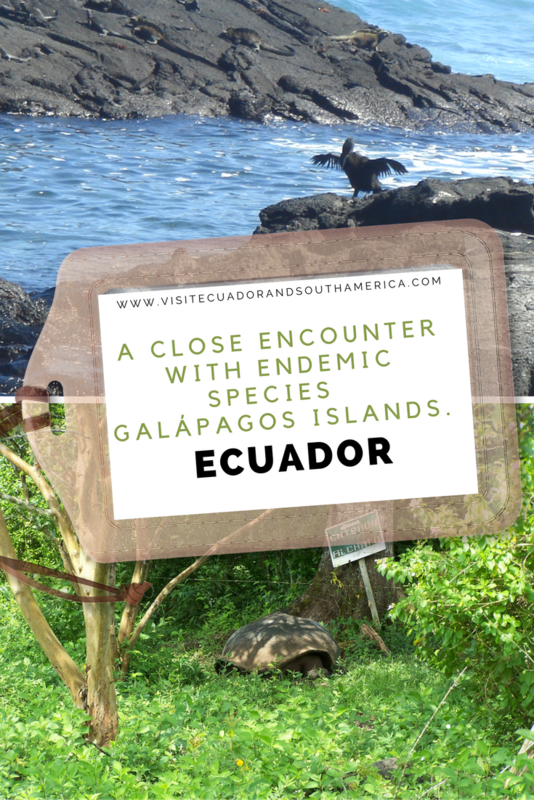 In sum, the islands bring great opportunities for tourists to enjoy some close encounters with endemic species. I have not mentioned all of them, so be ready to experience even more wonderful flora and fauna during your visit. Have you included a visit to the Galápagos Islands to your bucket list? Comment below or send me an email, I can help you with more tips. ⟵Sachatamia, perfect spot for birdwatching surrounded by magnificent vistas! oh my word my oldest would love this adventure. Shes an animal lover and is basically a walking talking animal planet. Wow! This is such a nice place to visit and it is really a great family adventure most especially for kids. I am sure my daughter will love seeing this animals especially the giant tortoise, sea lion and the penguins. Wow! What a beautiful adventure. 🙂 And great photos too. My family and I go on trips every year. I’ll definitely bring this up as a talking point. I know my nephew would love it! Galapagos Island is so beautiful. Its on my bucket list of places that I need to go to. Oh how fun! What a beautiful island and so cool to come up and so close to the animals like that. Ever since I laid my eyes on a real live Galapagos turtle, I knew that i had to visit the place where they originated from. Seeing this post really makes me wish I can go there this instant, beautiful creatures! This looks like such an awesome place to visit and explore. You saw some amazing species out there! I never really made a bucket list of places i want to visit. Galapogos is one I saw on TV but never imagined going there. The pictures look amazing!